Having retired from public performance in December 2016, harpist Sharon Hanjian Rondeau is offering recordings of the many selections she played at weddings, receptions, and other special events over her 28-year professional career. Listeners may choose their favorites from among Sharon’s classical and Celtic repertoire played in her unique and articulated style. Please visit the online store for samples of downloadable songs for your playlist. Over the years, Sharon learned many of the Celtic songs by ear from vocals and other styles and adapted them for her instrument. Her arrangement of the wedding favorite, Johann Pachelbel’s “Celebrated Canon in D” was derived from the desire to present the popular selection in all of its simplicity while projecting a full, bright sound in a church or at an outdoor setting with every note heard. Sharon’s CD, “Celtic Reflections,” is available using the form on our Contact page and at CD Baby. Shaton has a presence on Spotify, SoundCloud, Google Play and Amazon, and her YouTube channel is here. Custom sound tracks and arrangements of public-domain material are available upon request. 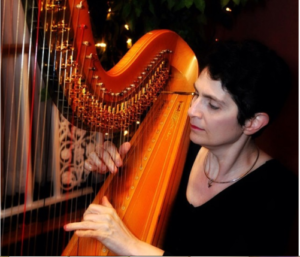 Sharon continues to be available for harp instruction for both children and adults in a traditional setting at her home in eastern Connecticut and by Skype. Her 80+ arrangements for lever and pedal harp are available at SheetMusicPlus, with a number also available at ScoreExchange, Harp.com, and in the store.